We've told you about the highways and our greatest risk in every country - the traffic. But many of you were most worried that we'd be abducted by drug-traffickers or thrown in prison by the "federales." And some have asked us why we weren't bringing a gun (Don't bring a gun to Mexico! You'll go straight to jail if it's discovered at a border crossing!). In terms of our everyday experience, we have to tell you that Mexico seems to be the safest country we've traveled in on our trip so far. Our perceived level of risk both to person and property is lower than in either Canada or the United States. Nobody has bothered us or our stuff in any way. Now we'll have to admit that we're not careless travelers and we keep our eyes on our things and don't leave our bikes unattended. We're experienced third-world travelers. And if somebody says an area is dangerous, we listen carefully and try to evaluate the risks. And we also have to admit that we aren't likely to be seen as good kidnapping subjects, since there's nobody to ask for a ransom. Most people here think our bikes are pretty cool, and pretty expensive by Mexican standards, but they don't seem to think we have all that much money (or we'd be going by car, right?) So maybe our risk level is lower because we're a small target. But I don't think so. I think Mexico is just a mighty calm, friendly place. 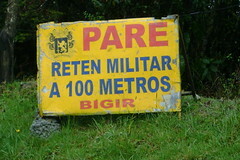 You´ve all heard of Colombia and the tremendous security/drug/paramilitary/guerrilla problems they´ve had over the years. Some of you told us not to go here because of what you had heard. We decided to go, however, because of what we heard from the cyclists who had actually passed through: it´s a calm country, beautiful, with incredibly friendly people. And that´s what we´re finding too. We haven´t had any problem, but we do read the paper and we do see the results of the strain they´ve had over the years. Basically, Colombia got buried under the corruption of drugs and the challenge of a revolutionary insurgency for decades. They seem to be digging their way out over the last ten years or so, and the current president, Alvaro Uribe, is immensely popular for the progress he´s made. The guerrilla group, the FARC, is still there and still holds some very important hostages, some that it's had for more than 8 years. But it seems to be declining in power and influence. You might wonder from reading the paper that their primary reason to keep holding those hostages is that it's their last grasp on power. The FARC seems to be still quite dependent on the drug trade for its financing.